Our Famous Disco & Ice Cream party turns 1! 5 x VIP Queue Jump Passes! Disco || Funk & Soul || House || Free Ice Cream! 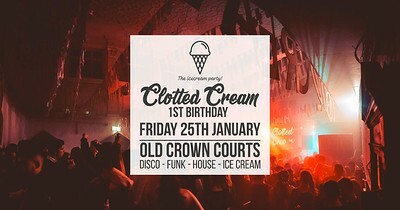 Clotted Cream’s first birthday is coming up, so what better way to celebrate than to throw a proper knees up!? As per we will be bringing the best DJ’s that Disco has to offer and enough ice cream to fill Old Crown Courts 10 times over. We’ve had a mad first year, taking our parties up & down the country, all of which have been something special. But our birthday wouldn’t be right if it wasn’t back in our favourite old Bristol Venue & with all you lot that make our parties so great! We want to make our Birthday extra special, bringing with us our immersive disco decor across Old Crown Courts many rooms, filling the venue head to toe with Disco and coming strong with an ice cream scoop in each hand.